Do you have a few extra hours in Houston? Make the most of them with a mini Downtown Adventure. 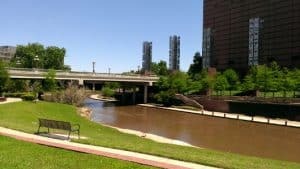 Three hours is enough time to grab lunch at Market Square Park, find the Big Bubble on Buffalo Bayou, explore the Bayou Trail and visit the Downtown Aquarium. 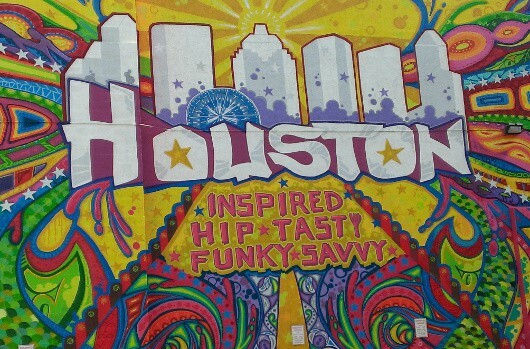 For a map of Downtown Houston, go HERE. To start, drive or take MERTORail to the Preston Street Station. Walk a few blocks west(ish) from the train tracks, on Preston Street, and you will run in to Market Square Park. Just before the park, stop to take your picture on this huge Houston mural. Once at Market Square Park, order lunch at Niko Nikos and let the kids run wild in the grass. 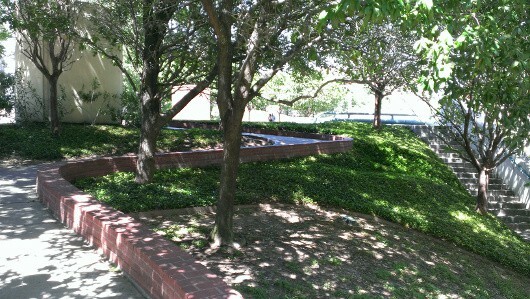 This park has a fantastic patio, with huge fans to keep you cool on a hot Houston day. It is kid and dog friendly with big open space and a dog run. There are also several fountains and many benches. After lunch, gather up your crew and walk a couple more blocks west(ish) towards the Buffalo Bayou. On the same side of the street as Market Square Park, you will walk right by Baker Common. This is a big open green space with access to the Bayou Trail. Stop to roll down the hill or sit on the benches. Instead of heading down to the bayou from here, head back to street level and walk to the Preston Street Bridge. 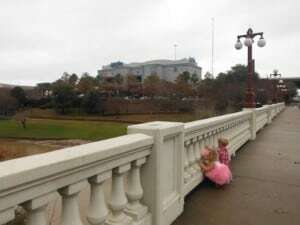 On this bridge is one of the most unexpected things in Downtown Houston. On the brick pillar on the southeast(ish) corner of the bridge (the closest pillar, but across the street from Market Square Park), is a mysterious red button. There is no sign above this little button. It is just a mysterious red button in the middle of Downtown Houston. You don’t know whether you should press it or not. And if you do press it, what will happen? Where should you look? And say you see or hear the bubbles, what is causing it? Did you wake a bayou monster? And if a boat is traveling down the river, what would happen if you time the bubbles just right? For best results, on your walk, tell your kids you hear there is a mysterious red button in Downtown Houston and you need to find out what it does. Get them close to the pillar and see if they can find it. Once you find it, ask for ideas on what it might do and see who is brave enough to push it. Once pressed, try to find the bubbles and ask what could be causing them. Finish up with several minutes of pressing the button, running to the side of the bridge, watching the bubbles and giggling with delight. When you have had enough, walk across the bridge to the other side of the bayou. You could cross Bagby Street to get to the Downtown Aquarium, but instead, find the stroller/handicap ramp down to the Buffalo Bayou Trail. It is on the same side of Preston as the red button. Walk down the long ramp and continue straight along side the water. Feed the ducks and watch out for the many cyclist riding along the path. The sidewalk will take you under the overpass and you will find the back entrance to the Downtown Aquarium on your right hand side. Once you are at the Downtown Aquarium, decide how much you want to do. If you want the full adventure pass, be sure to look on the website HERE because there are often Buy One Get One Free coupons. This allows you to walk through the aquarium and ride all of the rides. Another option is to just visit the aquarium for about half of the price. 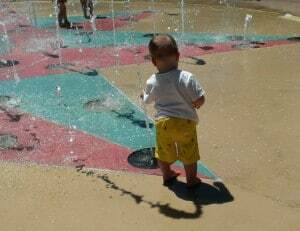 Or, my favorite option, is to splash in the splash pad for free. There is no cost to visit the big patio and the bathrooms are open to everyone. There is a DJ, splash pad and free trainer shows throughout the day. Without spending any money, you can have a great time at the Downtown Aquarium. When you are out of time, walk back to your car or the METRORail. If you don’t feel like walking, look for the horse and carriage the swings by the Downtown Aquarium. On your way home, pat yourself on the back because this was a few hours very well spent. 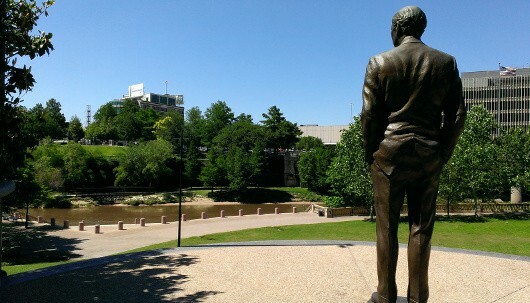 You toured Houston like a local and made some memories with your kids. Are you looking more ideas for exploring Downtown Houston with kids? 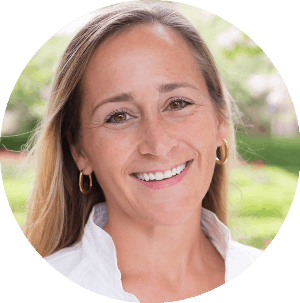 Go HERE to learn more! Where in Houston? The Black Labrador Pub!